Wind energy works well on properties with a good wind resource. The Wind Energy Program provides wind resource maps that show average wind energy across each state. These maps provide a good overview of your state’s wind resources. However, wind can vary due to your locations physical characteristics which may include trees, hills and buildings. An experienced renewable energy contractor can perform a more detailed wind assessment to accurately define, measure, and forecast available wind resources at your location. How much energy will a wind turbine generate? The amount of energy produced by a wind turbine is dependent on its size and the speed of the wind. 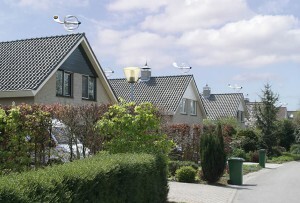 Residential wind turbines typically have a generation capacity of 400 watts to 100 kilowatts. If a 10 Kilowatt turbine is installed in an area with 12mph winds, it can produce an estimated 10,000 kWh per year, enough to power an average household for a year. Your renewable energy contractor can determine the size of turbine you require by estimating the amount of energy you need against the wind energy production you can expect at your location. What zoning and permit issues will affect construction of a wind turbine? Zoning laws control whether or not you can install a wind turbine at your location and may restrict its height although a variance may be obtained. Generally, zoning for wind turbines is easier in rural areas than in urban and suburban locations. Check your local zoning laws or ask your renewable energy contractor for help. Building and electrical permits can also be obtained by your contractor to ensure the structural and electrical safety of your turbine. Where should I build a wind turbine? Wind turbines are best placed in open plains or hilltops using towers to provide access to strong, prevailing winds. The bottom of the turbine blade should be a minimum of 30 feet above anything within 300 – 500 feet of the turbine. You’ll want to take into consideration any obstacles that may hinder the speed and force of wind flow including buildings and the present and future height of trees. The higher the turbine is, the more wind energy can be harnessed. Your renewable energy technician can help determine the best place for your turbine. Do wind turbines produce any noise? Today’s wind turbines are made with slender, aerodynamic blade tips that create little noise. Since background noises – traffic, rain, wind blowing through the trees – are very similar to the low inaudible sound of a wind turbine, it is difficult to recognize its sound in the environment. Can I connect my wind energy system to the utility grid? Wind energy systems can be grid-tied or connected to the local electrical grid. A grid-tied system allows you to pull electricity from the utility grid when your wind turbine is not producing power. When the wind system produces more power than your house needs, the excess is sent back to the utility grid. This is called net metering. You can receive credit for your excess energy which can then be applied to the electricity you get from the utility company when your energy usage exceeds your wind energy output. Using net metering can greatly reduce or even eliminate your electric bill. What is a hybrid wind energy system? Hybrid wind energy systems can provide reliable off-grid power for your home by combining wind and solar photovoltaic technologies. The varying peak operating times for wind and solar PV make hybrid systems more likely to produce power when you need it. At times when wind speeds are low during summer months, the sun shines the longest. And when less sunlight is available during winter months and at night, winds tend to be stronger. When neither the wind nor solar are producing energy, hybrid systems receive power through batteries or a generator. How long do wind energy turbines last? Wind energy turbines last approximately 20 to 25 years with regular maintenance. Do wind turbines affect birds? It has been found that wind turbines and wildlife are coexisting successfully. Wind energy’s overall impact on birds is extremely low compared to other causes such as utility lines, windows, buildings, pesticides, vehicles and cats. A more notable threat to birds comes from climate change and the loss of habitat worsened by the extraction and use of fossil fuels. What incentives are available for wind energy? DSIREusa.org can give you up-to-date information on incentives and policies that support the use of renewable energy. Federal tax credits and state incentives will significantly reduce the cost of your wind energy system. A renewable home energy contractor can help you turn the energy of the wind into clean, renewable electricity for your home. 1. Evaluation – Is wind energy a smart choice for you? 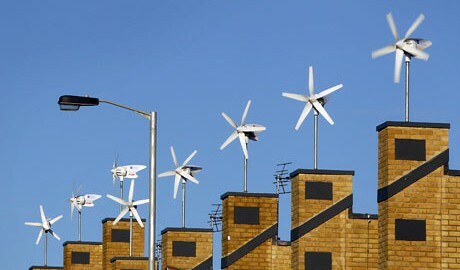 Does the wind blow fast and consistent enough at your property to make wind energy an economically wise choice for you? This question is not simply answered since many factors influence wind levels. To gain a clear picture of whether wind energy will work for you, a professional wind assessment study to accurately define, measure, and forecast available wind resources will need to be made at your site. Your renewable home energy contractor can do just that. Using wind resource maps and databases, a wind turbine contractor will evaluate the mean annual wind speed in your area. Since your specific location can have varied winds, wind speed and direction will also be measured on-site and analyzed. A thorough assessment of the terrain, layout and vegetation of your property will be performed taking into consideration any obstacles that may hinder the speed and force of wind flow including buildings and the present and future height of trees. Typically, wind turbines are placed in open plains and on hilltops or hillsides to ensure access to strong, prevailing winds. The bottom of the turbine blade should be a minimum of 30 feet above anything within 300 – 500 feet of the turbine. Since the speed and the force of the wind are essential factors to the amount of power a wind turbine generates, the higher the turbine is, the more wind energy can be harnessed. Your technician can locate the best place for your turbine to produce energy for primary, supplemental, or backup power use. The most common residential wind systems consist of a single horizontal-axis turbine with two or three blades that can produce just enough power to meet the demands of a home, farm or small business. To determine the height of the tower and the size of the rotor you require, your contractor will estimate the amount of energy you need against how much energy production you can expect from a wind turbine based on your average annual wind speed. The space needed for your system depends on the type of tower your turbine uses. A guyed tower consisting of a metal tower supported by guy cables and earth anchors needs a large radius that is one-half to three-quarters of the tower height, whereas a self-supporting lattice or a monopole/tubular tower takes up less room. Whether your wind energy will be used to power your home or a water pumping system for your farm, the length of the wire run between the turbine and its load will be carefully evaluated since a substantial amount of electricity can be lost the longer the wire run. Your renewable home energy contractor will handle any local permits and zoning requirements as well as neighborhood ordinances regarding wind turbine construction in your area. While construction of industrial wind farms can take several months to a year or more depending on their size, residential wind turbine towers usually take just a few days. The assembly of your turbine system may vary. Typically, the tower of the turbine is secured to the ground on a cement base at the chosen site. This cement, once poured, will need to cure for several days. The tower poles and the generator may be hoisted and secured to the base using a crane. If a tilt-down tower is used, the assembled system can be raised and lowered automatically. This makes maintenance easier for the homeowner. Your contractor will also install all the system components that connect the wind turbine to your home or other application. Wind energy systems are one of the most cost-effective home-based renewable energy systems available. Proper placement of your turbine is essential to its performance and stability since poor placement in extremely turbulent conditions may shorten its working life. Your renewable home energy contractor will provide ongoing regular inspections as well as monitoring services to ensure the highest production of electricity possible. Quality wind turbines are engineered for safety and are designed for over 20 years of operation to give you maximum return on your renewable energy investment. If properly installed and maintained, your new wind turbine will supply you with clean, inexpensive energy for many years. Wind energy is the fastest growing renewable energy source in the world. With a residential wind turbine, you can significantly reduce your energy bill and produce clean, affordable electricity for your home or business. Check out all the environmental, social and economic benefits of wind power! clean – it won’t pollute the air we breathe or the water we drink. A single 1 megawatt wind turbine can displace 1800 tons of carbon dioxide in one year. Wind is a clean source of renewable energy that can be used to generate electricity. Large wind turbines produce enough electricity to power entire cities, whereas smaller turbines can be installed in your backyard to power your home. Why is wind good for us? Wind turbines capture the wind’s energy and convert it to electricity, resulting in a less expensive alternative to your high energy bill each month. As wind passes across the blades, the turbine begins to move. This allows the electric generator inside the turbine to produce electricity, which can be directly applied to your home’s needs or stored in batteries for later use. Wind energy doesn’t require any fuel to operate and is a very efficient form of renewable energy. 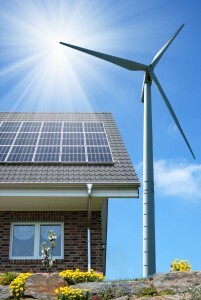 To learn if wind energy is a viable alternative for your home, connect with an installer today. Unlike solar photovoltaic (PV) systems that collect light from the sun and convert it into electricity, solar hot water systems collect the heat of the sun and transfer it to water. Millions of homes and businesses around the globe use solar water heating systems because they are one of the most cost effective renewable energy sources available. How much money can I save using solar hot water? Switching to solar hot water can decrease your water heating bill by 50%-80%! Since water heating can account for a quarter of your total energy bill every month, using solar hot water can provide substantial savings. Does solar hot water work when it’s cloudy or cold? Although the heat output of the solar collector is reduced on cold, overcast days, it will still be able to provide considerable heating. Evacuated Tube Collectors are suitable for such conditions as their round shape enables them to absorb the sun’s heat at many angles increasing their performance. 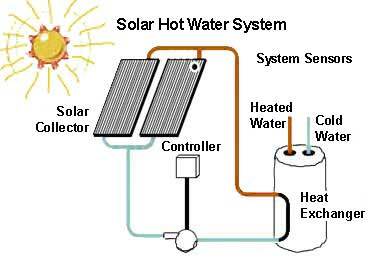 Will a solar hot water system supply all of my hot water? Solar hot water systems typically supply up to 80% of hot water needs. During summer months, the system may provide all hot water needs. When there is less solar energy available in the winter or on cloudy days, a backup system fueled by gas, electric or solar photovoltaic panels can be used to supplement the hot water supply. Do I need to change my hot water routine when using a solar hot water system? With solar hot water and a backup water heater, you will actually have much more hot water than ever before. You can increase your savings by not relying on the backup system with some simple hot water saving tips: space out laundry loads during sunlight hours to allow the solar water heater to replenish its supply, install low flow faucets and shower heads to reduce the amount of water used, and fix leaky faucets to preserve water. How much money can I expect to save with incentives? DSIREusa.org can give you up-to-date information on incentives and policies that support the use of renewable energy. Federal tax credits and state incentives will significantly reduce the cost of your solar hot water system. How do I pick the right solar hot water system for my needs? 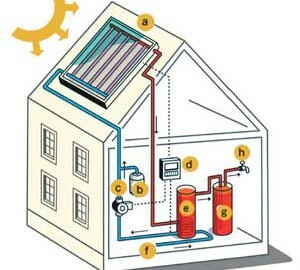 Solar hot water systems come in a variety of configurations. Your renewable energy contractor will evaluate which type of solar collector, circulation system and tank you need based on your location and the average hot water usage for your household. Where should solar hot water collectors be located? To benefit from solar energy, collectors should be placed in an area with unobstructed sunlight throughout the year, usually on a roof that faces south, southeast, or southwest. 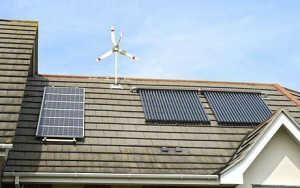 How long does a solar hot water system last? Many solar hot water systems can last 20 years or more. Most come with a five to ten year warranty and require little maintenance. How hot is the water from a solar hot water system? Solar water heaters can heat water well past the typical 120 degrees used by average households, especially during the summer. Systems have tempering valves to keep water leaving the tank at a safe temperature. During winter or cloudy days, your conventional hot water system will ensure your water remains hot. Solar hot water systems are economically smart, reliable and good for the environment. Take advantage of the many benefits of using solar hot water by contacting a renewable home energy contractor in your area today! Financial Savings – With 50% to 80% savings on your hot water bill, you’ll see a return on your investment in as little as 3 to 5 years – that means years of free hot water after your investment is paid for! Increased Hot Water Supply – Your solar hot water tank and backup tank together will supply twice as much hot water for less money. Energy Independence – Solar hot water will reduce your dependence on foreign energy sources by harnessing the sun’s free, abundant energy. Healthier Environment – Switching to solar hot water will help clean the air you breathe by reducing CO2 emissions. Useful Incentives – Check DSIREUSA.org for information on financial incentives that make solar hot water a practical investment for you. 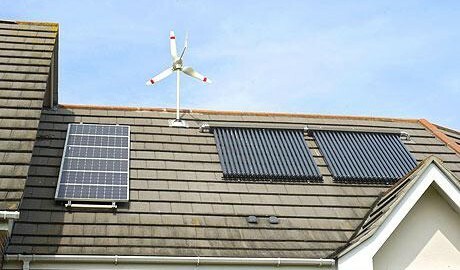 Increased Property Value – Renewable energy systems like solar hot water add resale value to your home. Long Lasting – Solar hot water systems are low maintenance and can last more than 20 years. Since solar hot water systems come in a wide variety of designs, your renewable energy contractor will determine which type of collector, circulation system, storage tank and backup system to use to meet your solar hot water needs. 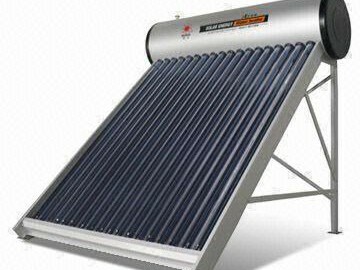 Solar collectors – Solar hot water works by first absorbing the sunlight and converting it to heat using a solar collector. Your renewable energy contractor will evaluate your site to determine if adequate sunlight is available. Your solar collectors should be mounted on a site that receives ample, unobstructed sunlight throughout the year. 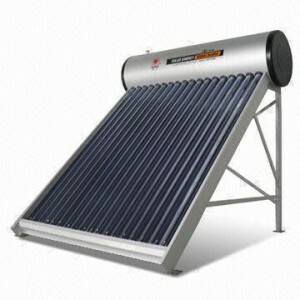 Solar water heating is one of the most efficient solar technologies when used in the proper location. 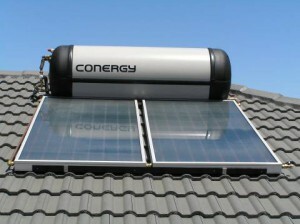 Active Solar Water Heating Systems – Active systems are the most common solar water circulation systems used. These systems use electric pumps to efficiently circulate fluids through the collectors and into the tank. Since active systems storage tanks do not need to be installed above or close to the solar collectors, they are a good choice for colder climates. Passive Solar Water Heating Systems – Passive systems do not use a pump to circulate fluids but use natural convection or gravity. Typically they may not be as efficient as active systems but they are less expensive and tend to last longer. Passive systems work well in warm climates. Storage Tanks – Your renewable energy contractor will estimate the required tank size to meet your hot water needs. Most solar hot water systems incorporate a well-insulated storage tank so the hot water can last for a few days. An 80 gallon storage tank is usually sufficient for 3 or 4 people. 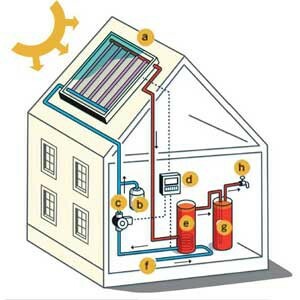 Backup system – Solar hot water systems typically supply up to 80% of hot water needs. During summer months, the system may provide almost all hot water needs. When there is less solar energy available in the winter or on cloudy days, a backup system using gas, electric or solar photovoltaic panels supplements hot water supply. The sun emits enough energy to power the whole planet for an entire year, every hour. By using solar energy as your primary heat source, you can cut your energy bill in half while having unlimited access to hot water for your home. Solar Hot Water is a form of renewable energy that captures the sun’s energy and uses it to heat the water in your water tank. This benefits homeowners where the demand for hot water has a large impact on energy bills, such as frequent laundry washing or large families. Solar hot water heaters can operate in any climate. However, performance varies depending on how much solar energy is available at the site. To take advantage of these heaters, you must have an unshaded, south-facing roof on your property. 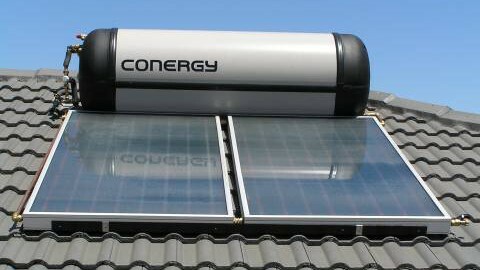 Solar water heaters use the sun to heat the water or a heat-transfer fluid, and then transferred to a well-insulated storage tank. Learn more about Solar Hot Water as an alternative to your conventional hot water system by connecting with an installer today. Will solar power work for me? 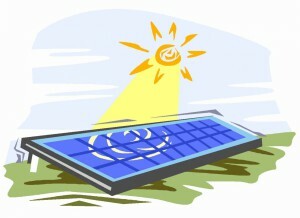 To reap the rewards of solar power, solar panels should be placed where they receive the most sunlight possible. This is typically on south facing roofs that receive unobstructed sunlight. However, wall, pole or ground mounted panels as well as tracking mounts that can tilt panels toward the sun may also make solar a viable option. A qualified solar technician can assess your property and your energy usage to help you find the renewable energy source that’s right for you. How much money will I save using solar energy? Exact savings is dependent upon the output of your solar energy system and your electric usage. To get a general estimate of savings, use our solar calculator below. Do solar panels work when it’s cloudy or cold? Even on a cloudy day your panels will still produce electricity since solar panels collect direct and diffused light. Solar cells use this light to produce energy, so they don’t need heat to function. Solar panels conduct electricity better when they are cold and work well in cool climates. Most solar panels come with a 25 year warranty, however, they may continue to remain effective long after this. Some homeowners claim that their panels continue to produce adequate electricity well after their warranty period ends. Solar panel systems installed with no moving parts will require little to no maintenance. What is the difference between off grid and grid-tied? An off grid solar energy system is not tied to the local utility company. This system requires a back up energy source, such as a battery or a generator, to be used during times your solar panels are not generating electricity. A grid-tied solar energy system is connected to the local utility power grid. Grid tied systems allow you to pull electricity from the utility grid when your solar panels aren’t producing electricity. In turn, any excess power generated by your panels during the day is fed back to the utility company. Since many solar powered homes generate more electricity than needed during daylight hours, net metering allows the homeowners whose solar energy systems are grid-tied to receive a credit for power generated by their system that is sent back to the grid. These credits for net excess generation may be applied to electricity the homeowner pulls from the utility company at night or when their electricity usage exceeds their solar energy output. Using net metering can greatly reduce or even eliminate your electric bill. How do I get power at night? If your system is grid tied, it will still be connected to the local utility which will automatically feed your home power when you need it. If your system is off grid, it will no longer be connected to the utility company and you will need a backup battery to store excess energy generated during the day for nighttime use. Your renewable home energy technician will help choose the right type and size battery to meet your energy needs. DSIREusa.org can give you up-to-date information on incentives and policies that support the use of renewable energy. 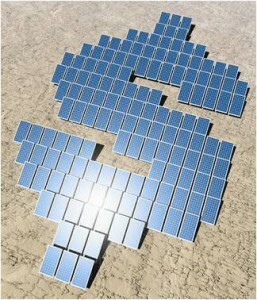 Federal tax credits and state incentives will significantly reduce the cost of your solar energy system. Do I need to replace my roof before I install solar panels? Since solar panels will last over 25 years, your roof should be in good condition and no more than 10 years old. If your budget is limited, you may replace only the roof tiles where the solar panels will be placed. Remember that solar panels will greatly reduce the wear on the roof by protecting it from snow, ice, and ultraviolet rays. Truth – Solar panels collect direct and diffused light, so even on a cloudy day your panels will still produce adequate levels of electricity. Since solar cells absorb light to produce energy, they don’t need heat to function. Solar panels actually conduct electricity better when they are cold so they work well in cooler climates. Truth – Solar panels can face southeast or southwest and still perform. Plus, there are a variety of alternative installation options for solar panels including ground, wall and pole mounting as well as tracking mounts that automatically tilt panels toward the sun. Truth – The cost of solar panels has fallen sharply since the end of 2010, making them more affordable. Rebates, tax credits, leasing and financing options will also decrease the cost of your system drastically. And don’t forget to factor in the immediate savings on your electric bill. All these things should be considered when measuring the economic benefits of going solar. Truth – Solar power comes from the renewable energy of the sun, a resource that will never run out. Using solar energy can be more reliable than the utility company since it is not subject to power outages. Also, solar panel systems require little to no maintenance as they have no moving parts and have a 25 plus year lifespan. Truth – The savings on your electric bill is immediate. Many homeowners report that they have cut their energy bills between 50% and 100% after installing solar panels. With rebates, incentives, and tax cuts, the return on your solar investment could be much sooner than you think. As prices for fossil fuels continue to rise, solar power is a beneficial and economical option for everyone. Truth – Solar panels today are better engineered to blend into the roof of your building. Many have been designed to integrate with a wide range of architectural styles and environments. Solar shingles, for example, blend almost seamlessly with traditional roofing materials. 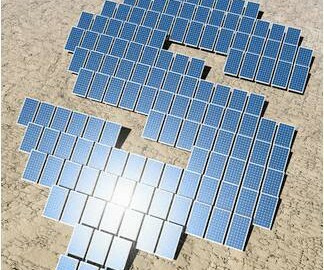 The U.S. is one of the fastest growing solar energy markets in the world. Many states now require utilities to sell an increasing amount of renewable electricity. Unlike the limited supply and rising costs of fossil fuels, the supply of solar energy is unlimited giving consumers an energy independence not possible with fossil fuels.